Officinalis is the species name of the herb sage which is a founding member of herb gardens. It is generally a plant with grey leaves and mauve flowers, but there is a purple leaved variety “Purpurescens’, one purple, yellow and green ‘Tricolor’ (as above in the banner) and a yellow and green ‘Icterina’. ‘Berggarten’ is a variety of officinalis with regular grey leaves and a good clumping habit but it rarely flowers. There are also pink and white flowering officinalis available in Australia but it may take some searching. This photo is taken at Geelong Botanic Gardens where there was blue flowering officinalis and pink at the back. Spring flowering, beginning about October. Salvia officinalis has been used and cultivated around the Mediterranean for hundreds of years. Over time lots of medicinal uses have come to be appreciated. It is often used in cold remedies for expectorant properties. 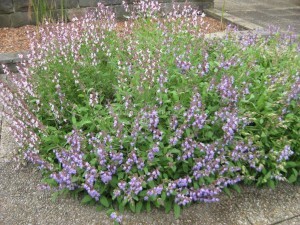 These salvias grow up to a metre in height and are evergreen, drought and frost hardy. As is often the case with grey salvias, if you water too much at the wrong time they will readily curl up and die. I find growing them under eaves helps prolong their life, or entirely ignoring them with the hose. In Mediterranean countries I am sure they live a number of years. 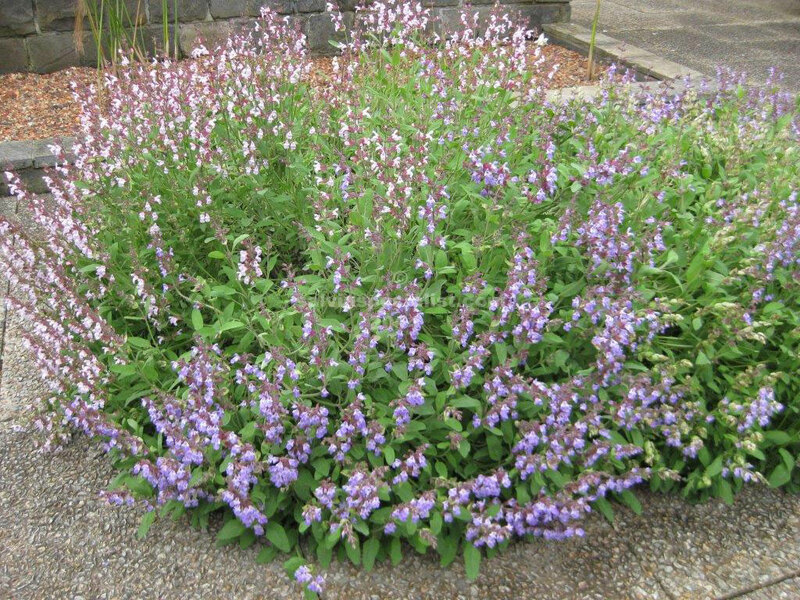 I don’t usually sell salvia officinalis because it is a problem with watering in a nursery and they are usually readily obtainable in nurseries.